The Food Alphabet and More: The Great Donburi Taiketsu (Showdown) + GC Giveaway! A longtime staple of Tokyo Tokyo, its Donburi line up captures authentic Japanese taste with each mouthful. The Maki Donburi bowl is a surprising twist on Tokyo Tokyo’s popular California Maki, featuring a combination of crunchy Kani and crispy onion rings drizzled with zesty Japanese Mayo and a savory sauce. It's time to eat up and enjoy Tokyo Tokyo's Maki and Shrimp Katsu Donburi! Don't forget classic favorites such as Pork Katsudon, Chicken Oyakodon, Salmon and Hamburg donburi. Now for the giveaway! So which is your favorite? 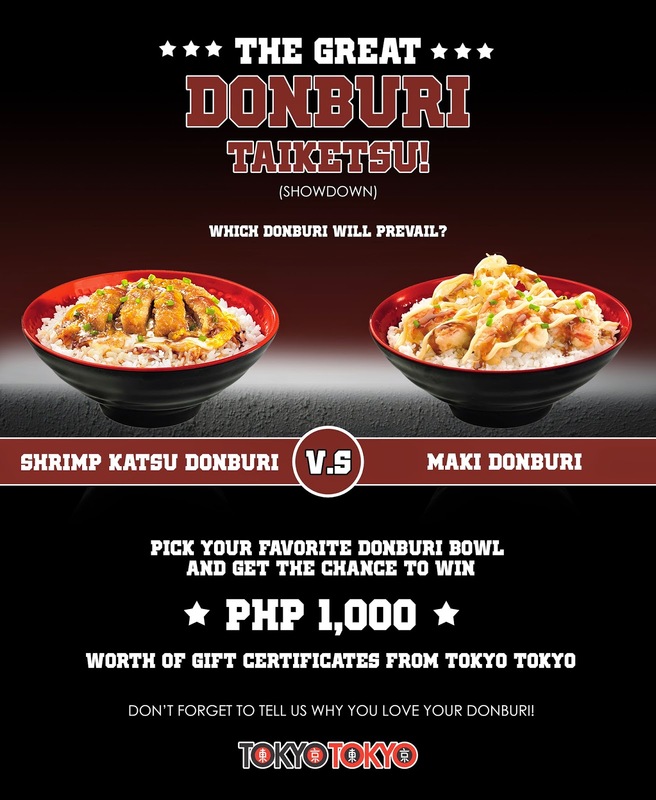 Let's all join, just choose which Donburi you like better by answering this Survey! Answer the survey only once, answering the same survey over again will not increase your chance of winning. Winners will be chosen from the group of the winning Donburi bowl and will be announced here. This giveaway is on now until April 22. Winners will be advised on how they will be get their prizes. Join up and win P1,000 GC's from Tokyo Tokyo! Check out Tokyo Tokyo's Facebook and Instagram (TokyoTokyoPhilippines) to be always updated for more deals and promotions! Shrimp Katsu Donburi for me! I voted for Shrimp Katsu Donburi! YUM!